Iris Apfel is an American businesswoman, interior designer, and fashion icon. And she has amazing (and often hilarious views) on fashion, romance and relationships. All seen through the lens of a visit to the zoo. As fans of comedy around the world mourn the death of Jerry Lewis at 91, we decided to take a moment to focus on the jewelry choices of this fine comedian…and what an interesting story to share. According to a classic movie blog, Lewis frequently–if not always–wore two rings in any film he appeared, regardless of whether it was appropriate for the character (which it often wasn’t). The other is a pinky ring with an enormous sapphire (which can be seen in the photo above). These rings almost never fit with Lewis’ characters, who tended to be not only single, but not wealthy enough to afford such fancy jewelry. Knowing jewelry the way we do, we have a different guess: each ring must have had enormous personal importance to him, possibly in the same vain as good luck charms he felt compelled to wear throughout much of his life, not just in films. Regardless of the reason, let’s say farewell to Mr. Lewis and the real charm he possessed: an amazing sense of humor. What Famous People wear Good Luck Charms? Most of us have a good luck charm or two, without even knowing it. It’s that go-to piece of jewelry we put in that makes us feel safe, comforted. The longer we wear it, the more it seems to grow in strength. Or so we like to believe. And perhaps that belief is enough to “charm” our lucky piece. If we simply feel more confident and emboldened when we wear it, didn’t it work its magic already? Celebrities have a long history of good luck charms. And athletes too (who often feel that that their charm of choice helps them win a game). Lindsay Lohan had a favorite bracelet as a lucky charm. Cate Blanchett proudly displays her bronzed Lord of the Rings elf ears in her home for a dose of good luck. Benicio del Toro wears a ring with a wooden core so he can always knock on wood whenever needed. Cameron Diaz wears a lucky charm necklace to ward off aging. Some celebrities and sports stars deviate from jewelry as good luck charms. Helen Mirren dons a lucky pair of shoes she wears to awards shows. What about you? What’s your good luck charm? Don’t forget: you can always create one of your own, with every element of it representing aspects of you. Learn more about our custom design process. In 2012, Blake Lively and her husband Ryan Reynolds surprised the world when they got married (on the sly). Reynolds put a gorgeous 12-carat oval-cut diamond on Lively’s finger (allegedly valued at a cool $2 million). Our Lively-inspired ring is an oval pave halo custom made engagement ring with three rows of pavé diamonds that inspires celebrity levels ooh’s and ahh’s…and definitely not anywhere near $2 million! Do you have a celebrity ring that you love? Send us your images or links and talk to one of our extremely helpful staff members so we can turn your dream jewelry into a wearable reality! So what does the girl who could wear anything wear? And what other essentials should every girl own? “I think a great pair of earrings like hoops or studs, and a cocktail ring, which is always nice for an evening,” she said. We’re more than just jewelers here at Joseph Schubach’s. We consider ourselves fashionistas of sorts. And why wouldn’t we? Jewelry and fashion go together like Romeo and Juliet, like peanut butter and jelly, like diamonds and forever! So we couldn’t help ourselves after watching the insanely popular Beyonce video “Lemonade” that aired on HBO on April 23. It’s an epic watch, containing all of the tracks from her new album. The dress? A canary yellow ruffled Roberto Cavalli number designed specifically for her. Love the fat hoop earrings to add an extra level of boldness. 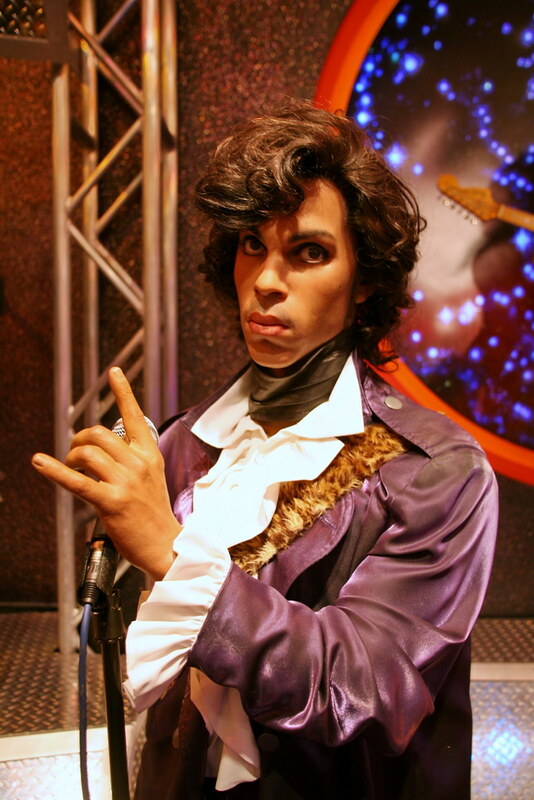 We’re still reeling from the death of Prince. 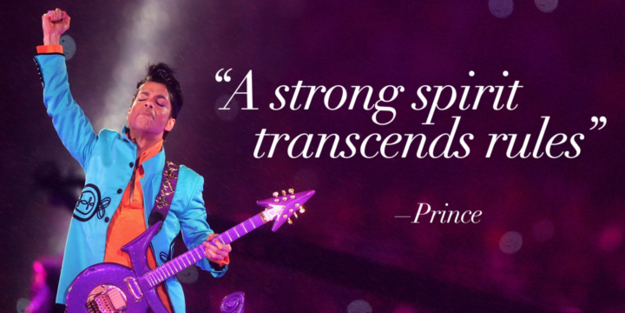 Not only has his music defined eras in our lives but his truly iconoclastic spirit has inspired millions of us. 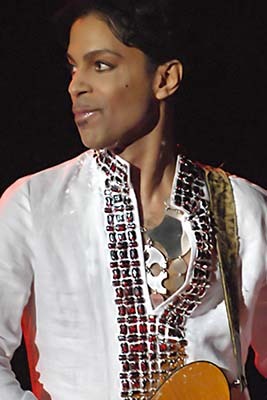 His fashion was uniquely his and often ahead of it’s time, expressing flamboyance, style and a broader vision of gender and sexuality. May we all continue to be a bit bolder and spirit-free in his wake. There are no accidents. And if there are, it’s up to us to look at them as something else. And that bravery is what creates new flowers. The actress, who recently revealed that she’s divorcing husband Will Kopelman after nearly four years of marriage, has decided to ditch her wedding ring and rock a new accessory on that finger. And it’s not just any random piece. The Oscars are all about flash and glitz…but some celebrities manage to combine over-the-top with creativity. And that’s why we’re giving an in-house Oscar to Whoopi Goldberg who donned a sea-worthy stunner on hand last night. 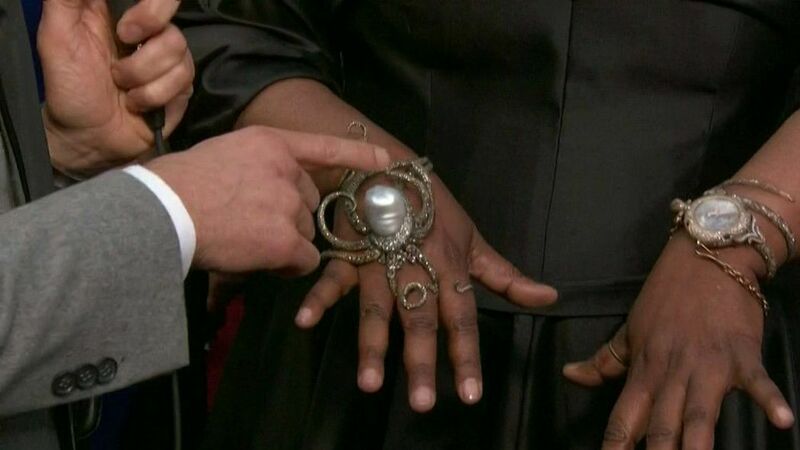 Some critics took to panning her octopus ring (we couldn’t find the designer’s name of this ring as of this a.m.) but we appreciated the actress honoring a time-honored fashion rule: if you’re going to wear a statement piece (a large and loud piece of jewelry), pair it with something simple, like a black dress.